The 28th Anniversary Golden Stave Golf Day will now be held on Friday 17th May at the Beverley Park Golf Club. Featuring the "David Gilchrist Ambrose Challenge" As usual the day will be lots of fun and enjoyment which we are well known for. The format will be the usual 4 ball Ambrose, with a lot of additional surprises over the 18 holes. To support this fantastic level of support we are proving free food and drink on course all inclusive. Each year we celebrate “David Gilchrist Ambrose Challenge” in memory of our good mate and former loyal hard working committee member David Gilchrist. So we ask all our loyal supporters and friends to join us and honour David’s memory on Friday 17th May and pay tribute to David in a way he would have liked. By helping make it a wonderful day to remember of golfing fun and raising even more money for kids in need. Australian Long Drive Champion Mark “Boomer” Bylsma will be joining us for a golf clinic plus also on the long drive holes and will hit balls for all the competitors. 8.00 am Registration and BBQ Sausage Sizzle Breakfast. 9.30 am Shotgun Tee-Off! Proceeded by a short Golf Clinic. 1.30 pm Lunch and drinks in the Clubhouse followed by the Presentation and Prizes ceremony! Fee includes green fees, balls/tees, motorised golf cart hire, team photograph, goodies show bag, BBQ Sausage Sizzle Breakfast, post event Lunch and Drinks for your team. As always the Golf Committee has some surprises in store which will make for a day of fun and laughter so that you can enjoy and feel confident to bring your clients along. To book now, simply click on RESERVE NOW, you must be a Golden Stave Member to buy tickets and have a current credit card! Reserve Now Golden Stave Supporters Club Membership is free of charge, join now or check that you are not already a member by clicking on Forgotten Password and entering your email address for Membership verification. On the course, in the Clubhouse and practice areas - shirts with attached collars worn tucked into tailored slacks and shorts. It does not matter if you do not have a handicap, the committee will allocate on your last score. If you have any questions or wish to become a sponsor, please email Larry Warren (General Manager) at larry@goldenstave.com.au , or call Larry on 0406 428 969. The Grand Opening of the new par 70 layout by the Federal Treasurer, Hon Scott Morrison, Mark Coure MP, Member for Oatley and Gail Connolly, General Manager of Georges River Council on Saturday 24 September 2016 attracted nothing but positive and encouraging comments. This all occurred in the midst of our 75th anniversary. 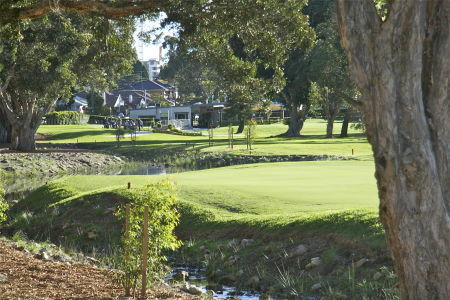 Beverley Park Golf Course built its image over many decades but the water mitigation program has elevated this course to one of the most outstanding public golf courses in NSW with greens second to none.